And the Children's Choice Author of the Year is... Rush Limbaugh? This is not a joke. 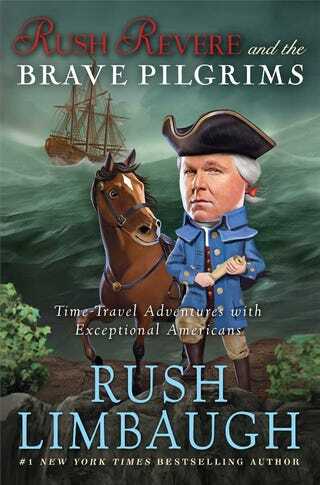 Rush Limbaugh has just been named Author of the Year by the Children's Book Council, for his book Rush Revere and the Brave Pilgrims: Time-Travel Adventures with Exceptional Americans. What an interesting concept, I'm sure you're saying. Tell me more about this book! Well, the plot focuses on substitute teacher Rush Revere as he visits significant events in American history on a time-travelling talking horse, accompanied by a jock/secret nerd and a vaguely-Native American girl named Freedom. Along the way, says Kirkus, "Tommy and Rush school Bradford in the values of competition and individualism, while Bradford and Squanto give thanks to God for seeing them through adversity." Because of course they do. The Kirkus review also notes that the book is full of poor editing and errors and calls it, on the whole, "Exceptionally bad." One of their reviewers has gone on to say that the book is "God-awful. I mean really, breathtakingly, laughably terrible." It's worth noting that the Children's Choice Book Award winners are chosen by children, which is encouraging when you consider that (ostensibly) no one over the age of twelve was involved in this decision, but discouraging when your realize that so many children have actually read this. Interested parties can find the book wherever mediocre books are sold, along with the recently-released sequel, Rush Revere and the First Patriots.